Located in the south of Germany, Bavaria is its largest Federal State with a land area of 70,551 km².With respect to its 12.9 m inhabitantsand a gross domestic product of almost 600 bn €, Bavaria is in second place among all german regions. Since 85 % of Bavaria are rural areas, it is the most important Federal State regarding agriculture and forestry. Together with the upstream and downstream sector of the agriculture and food industry, its more than 106,000 farms and diverse production facilities generate around 121 bn € in sales and employ around 900,000 people. The forestry and wood sector, with its 700,000 forest owners and a turnover of around 37 bn€ and around 196,000 employees, is also an economic heavyweight and an anchor of stability in rural areas. 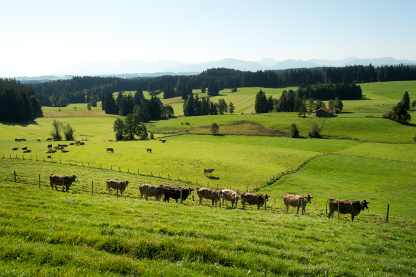 With an average farm size of 30 ha and a ratio of 39 % full-time versus 61 % part-time holdings, Bavarian agriculture is characterized by small structured multifunctional family farms. The Bavarian State Ministry of Food, Agriculture and Forestry is providing suitable framework conditions for competitive agricultural, forestry and food industries. It is promoting knowledge transfer, practice-oriented research and innovation. Besides the implementation of laws, regulations and directives it is EU Paying Agency for agricultural and fisheries funds.